Note: Programs that have required courses in the Summer must pay Summer tuition. For students residing on campus for the full academic year, the Housing Reservation Fee and Damage Deposit Fee is charged only once. This fee is refundable up to May 1. *Summer Housing is not always available. 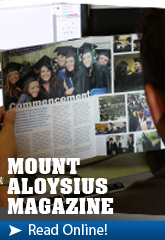 Mount Aloysius College’s full-time tuition covers from twelve (12) to eighteen (18) credit hours per semester. Each student’s account is to be paid or financial arrangements are to be made through the Controller’s Office in order to be officially registered at the College. The late payment fee can be avoided by making the required payment or completing financial arrangements by the stated due date. Previously incurred financial obligations must be paid in full before a student may register for another semester. Additional costs which a student incurs after the beginning of the semester are due and payable within thirty (30) days of posting to the student’s account. Students have 24/7 access to their online course and fee statement. Students with outstanding financial obligations will not be permitted to receive grades, transcripts, or participate in graduation. Students who drop below twelve (12) credits after the Add-Drop period of any semester will not have their tuition recalculated based on part-time status. Room and Board costs for students are $5,169 per semester for residents of Ihmsen Hall and St. Joseph’s Hall; $5,689 per semester for residents of Misciagna Hall and McAuley Hall; and $5,559 per semester for residents of St. Gertrude’s Hall and Park Avenue House. 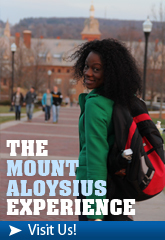 Each applicant to Mount Aloysius College is required to pay a one-time-only non-refundable application fee of $30. The application fee is submitted with the Application for Admission to the Vice President for Enrollment Management. A $65 fee will be assessed for each art course that requires materials for studio art activities. A $30 fee will be charged for each bad check or other instrument presented by or on behalf of the student and accepted by the College that is not negotiable. Payment of the fee and the amount of the non-negotiable instrument are due upon demand by the College. Resident students are required to pay a Housing Reservation Fee and Damage Deposit of $125. The Housing Reservation Fee and Damage Deposit reserves a room in campus housing and also functions as a damage deposit fee. This deposit is in addition to tuition, room, and board charges and will be refunded to the student less any damages to the room or dormitory or other remaining charges. A Late Payment Fee of $50 is charged to each student’s account for which the initial semester billing is unpaid or unsettled on the bill due date. A College Payment Plan is available to assist students in meeting their financial obligations. A non-refundable fee of $75 is due with the first installment payment. All eligible financial aid, including grants and loans, will be applied prior to calculating the amount due. First installments are due on the initial bill due dates. The first installment for the Fall Semester is due on July 15 and the first installment for the Spring Semester is due on December 15. The College reserves the right to refuse a payment plan to any student who has not met prior payment agreements. **Before withdrawing from the College, ask a Financial Aid Officer how it will alter your financial aid and the Billing Office how it will alter you bill. A withdrawal is considered official only after the completed withdrawal form has been processed. Students who withdraw from Online Programs prior to the first class will receive a 100% refund, prior to the second class, 95% refund; prior to the third class, 90% refund; prior to the fourth class, 50% refund; fourth class or after, no refund. Proration for students who withdraw from summer courses will follow the summer catalog. Students enrolling in modules who will be using financial aid must sign up for all classes they will be taking for all of the sessions. If a student signs up for all sessions, they are expected to attend and complete all sessions. If the student ceases to attend a course for which they were scheduled to attend, and they are not enrolled in any subsequent modules/sessions, the student will be considered a withdrawal and a Return to Title IV Funds calculation will be performed (see additional information below.) A weeks is defined as Monday to Sunday for all online courses. When a student who receives Title IV financial aid (Federal Pell Grant, FSEOG, Direct Subsidized and Unsubsidized Loans, and PLUS loans) withdraws, either officially or unofficially, before completing the period of enrollment for which they were charged, a return of Title IV funds may be required. First, the net amount of Title IV aid that was and could have been disbursed is calculated. Second, a calculation must be performed to determine the percentage of Title IV aid earned. The number of days attended by the student is divided by the number of days in the payment period. This equals the percentage of Title IV aid earned. If the percentage of Title IV aid earned is greater than 60 percent, the student is eligible for 100 percent of the aid. Third, if the amount of aid disbursed equals the amount of aid earned, no further calculation is required. Fourth, if the amount of aid disbursed is greater than the amount of aid earned, the difference must be returned to the appropriate Title IV agencies. The College will return Title IV monies as follows: Direct Unsubsidized Loan, Direct Subsidized Loan, Direct PLUS Loan, Federal Pell Grant, FSEOG and others. The student’s account will be debited for all monies returned to the Title IV agencies. The student will be responsible for paying any outstanding balance due to the Controller’s Office. 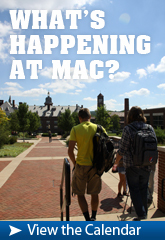 Questions regarding the Return of Title IV funds should be directed to the Financial Aid Office. Each full-time student accepted into the College is required to pay a non-refundable Reservation Fee of $200 which guarantees a place in class. The Reservation Fee is credited to each student’s tuition. All vehicles must be registered at the Security Office by the end of the first week of school. The non-refundable $40 fee is payable at the time of registration each academic year. Vehicles not registered will be subject to parking violations and fines. Textbooks and Supplies - Textbooks may be purchased at the campus bookstore. The cost averages about $500 a semester. Students should arrive each semester with sufficient funds to purchase books and supplies. Check Cashing - A student’s personal check under $50 may be cashed Monday - Friday, 8:30 a.m. - 5:00 p.m.
Student Health Insurance - Health Services provides information on student health insurance options through various insurance companies. Health insurance is strongly recommended for all students. Health insurance is required for international and resident students and intercollegiate athletes.